Spain became the first International team in Euro 2012 to play with a False No. 9 formation, in the 1-1 draw with Italy in Euro 2012 matchday 1. This formation is, of course, made famous by Guardiola’s Barcelona, with Messi or Fabregas playing the False number 9 role. With Barcelona’s players making up the bulk of the Spain team, it is of little surprise that the formation was utilised, with Fabregas playing the main role. Football critics said it didn’t work well in the Italy match. While this is debatable, the fact remains that Spain did not get all 3 points, meaning Spain still has a lot of work to do for the formation to work. Similar to my last post on playing Ronaldo in the False no. 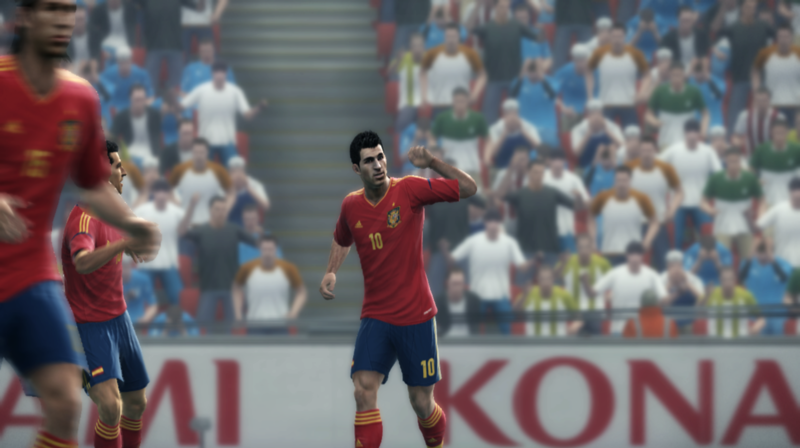 9 position, I tried to recreate the formation with the Spain International Team. I had wanted to field 6 midfielders, but it was not possible in PES 2012 as there has to be at least 1 forward. Thus, since Fabregas plays in the center, he was made the SS. My first formation didn’t work well, losing 1-0 due to a lack of support in attack. My next try was to play Iniesta as a Left Winger, bringing Fabregas down to a Central Attacking Midfielder. This formation did not work for me as well. I then adopted my first formation, and altered it by pushing the side midfielders higher up the pitch to support Fabregas. Guess I was third time lucky, as I managed to scored two goals with some decent build-up play. Fabregas scored 1 and assisted 1, which fulfilled his role well enough. The match ended in a draw though, which meant, just like Spain, I have to further improve on it. Check out the following video on the formation, as well as the two goals.